Commerce Minister Tipu Munshi speaks at a session titled ‘Doing Business with Japan’ at the 15th BASIS Soft Expo-2019 at International Convention City Bashundhara (ICCB) in the capital on Wednesday. Commerce Minister Tipu Munshi on Wednesday said more Japanese investment would expedite the development of Bangladesh. The minister said this at the plenary session titled “Doing Business with Japan” of the 15th BASIS Soft Expo-2019 in the capital, reports BSS. Terming Japan as the biggest development partner, Tipu said since the independence of Bangladesh Japan has been extending cooperation to the country and the government has decided to allocate a big economic zone to Japan as 100 special economic zones are being developed at the initiative of Prime Minister Sheikh Hasina. Tipu Munshi said Japan could extend cooperation to Bangladesh in IT sector. 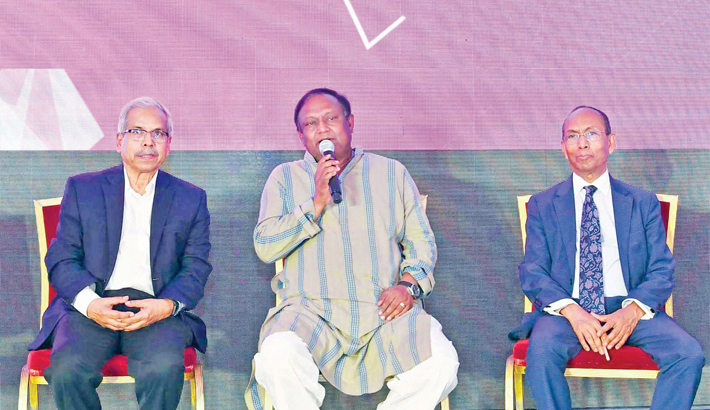 Bangladesh Association of Software and Information Services (BASIS) and ICT Division have jointly organized the 3-day mega event in country’s information and communication technology sector. Japan Development Institute’s Chairman Sholchi Kobayashi made keynote presentation. BIDA Chairman Kazi Aminul Islam, Japan-Bangladesh Society Chairman Matsushiro Horiquchi and Japan Bangladesh Chamber of Commerce and Industry General Secretary Tareque Al Rafi Bhuiyan also spoke on the occasion.